Like a great-grandmother in her armchair, serene with years of experience and spiritual fulfilment, dexterously swiping and tapping her iPhone, Chiang Mai is the perfect mixture of old and new. Amongst the rugged mountains, hills and valleys of Northern Thailand the city of Chiang Mai, whose name means ‘New City’, sits ancient and proud. 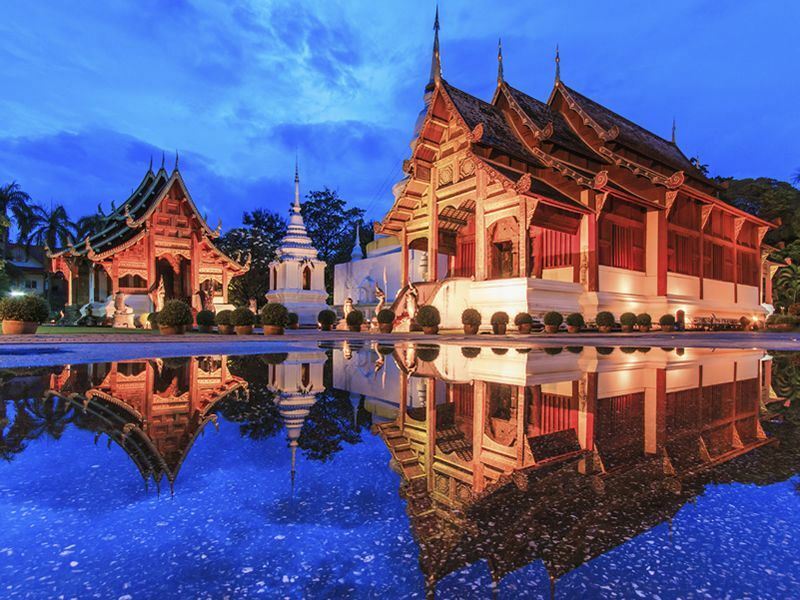 Succeeding Chang Rai as the capital of the Lanna kingdom in 1296, Chiang Mai centres around a historic moated quarter filled with startlingly ornate temples. Right up to the early 20th century, Chiang Mai was only accessible from Bangkok via an arduous journey on boat or elephant back, allowing the city to protect its unique heritage. Today Chiang Mai is a thoroughly modern city that has undergone rapid development and expansion in recent years. Outside of the historic centre Chiang Mai has a distinctly hip and international feel as many artists, creatives and young professionals have chosen the ever expanding city as a new place to work and play. From the humid plains of Chiang Mai you need only look up to catch a glimpse of the majestic mountain Doi Suthep where the cool and serene Wat Doi Suthep Buddhist Temple looks down from its great height. Many tour operators offer day trips up into the mountain’s cloud belt for a closer look at the symbol of Chiang Mai as well as nearby Doi Inthanon National Park, which is home to the highest mountain in Thailand. Hill tribes of various ethnicities still live in the hills surrounding Chiang Mai and organised treks, some lasting up to five days, are also popular amongst visitors. The Elephant Park, a sanctuary caring for ill and abused elephants, is a Chiang Mai institution. A highlight of my trip not just to Thailand, but to South East Asia overall, a visit to the Elephant Park is the best way to get up close and personal with these gentle giants while supporting the great work of the sanctuary. There are said to be over 300 Buddhist temples in Chiang Mai, with the oldest dating back to the 13th century. Sightseeing isn’t supposed to be an endurance sport so I would advise choosing a few of the temples you’d most like to see and spending an hour or two at each. Many of the larger temples offer daily ‘monk chats’, an opportunity for the Buddhist layman to speak to an actual monk, and various meditation sessions. A few of the most visited Wats include; Wat Chiang Man, the oldest Wat in Chiang Mai; Wat Chedi Luang, an earthquake-damaged Lanna Wat; Wat Phra Singh, home of the Phra Singh Buddha; Wat Kum Kam, a ruined temple site outside of the city and Wat Srisuphan, the beautiful silver temple. Chiang Mai is a highly spiritual place and its ancient and enduring focus on the inner workings of the soul has naturally been accompanied by an intense preoccupation with the inner workings of the mind. In short, the people of Chiang Mai like to learn. Taking a course in Chiang Mai is a great way to spend an afternoon and Thai Cooking, Thai Massage, Yoga, Painting and Thai Language are a few of the most popular courses available. Outdoor markets are wonderful in any country but in Chiang Mai, with its thriving art scene, traditional handcrafts, warm weather and delicious street food, the markets are something very special. The weekly Sunday Walking Market is the cream of the crop and offers such a cacophony of sights, smells and tastes, you’re likely to walk the whole 1km stretch down Ratchadamnoen Road and back before you commit to a purchase. The nightly market in the East end of the old town and the local Warorot Market is also worth a visit. I gaze as I’m typing this at a half-eaten supermarket sandwich and feel an almost painful pang of desire for some good Thai food. There are no two ways about this, the food in Chiang Mai is incredible. So much so that I wish I had somehow managed to eat more while I was there, like six meals a day instead of three. Thai food in Chiang Mai is peculiar to the north of the country, with tastes and cooking styles that are surprisingly different to those used in the south. Restaurants such as Tong, Huen Ten and Khan Toke are great places to sample this unique northern Thai fare. Many of Chiang Mai’s residents focus on eating clean and lean and there are a huge variety of vegetarian and even vegan restaurants around the city. A few worth checking out include ImmAim, Freebird Cafe, Blue Diamond and The Salad Bar. Thanks to Chiang Mai’s location close to Shan territory and the Myanmer border there is also a wealth of Burmese cuisine available. The Swan, D-Lo and Burmese Restaurant and Library are inexpensive cafe-style restaurants favoured by backpackers and locals. For fine dining you can do no wrong by visiting one of Chiang Mai’s many four and five start hotels for an evening. ‘Restaurant’ at the Chedi Hotel and the Dhara Devi Manadarin Hotel’s ‘Farang Ses’ are known for their opulence. The House in the old city and Antique House on the riverside are also good choices for a night of luxury. Like things to do and places to eat, you’re spoiled for choice when it comes to finding accommodation in Chiang Mai. From back alley mattress-on-floor backpacker extravaganzas, to mid-range chains to stand out luxury resorts, Chiang Mai has everything you would expect from a modern city. For an affordable stay steps from the Chiang Mai Night Bazaar try the four-star Central Duangtawan Hotel. If a hotel nestled underneath a 200-year Tamarind tree in the historic old town of Chiang Mai floats your boat then try the Tamarind Village Hotel or if you desire high-end luxury head to the five-star Rachamanka or The Chedi. More information and to book: Step away from the more common view of Thailand with its busy capitals and flamboyant architecture to enjoy a glimpse of rural life with this incredible Chiang Mai hill tribe experience tour.